Ladder To Damascus by Mohamad Malas has been selected at the 57th BFI London Film Festival. 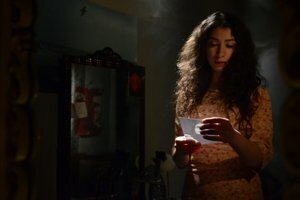 A young aspiring actress in Syria discovers she has been inhabited by the soul of a woman who died on the day she was born. Ladder to Damascus marks the return to cinema of legendary Syrian filmmaker Mohamad Malas after almost a decade-long absence. The ensuing years have seen Malas’ native Syria go from being one of the most politically stable – and stifling – regimes in the Arab world to one that has been torn apart by civil war for much of the last two years. Malas initially appears not to touch on the trauma of his country, focusing instead on a haunting love story. Ghalia is inhabited by the soul of Zeina, a girl who drowned the day she was born. Haunted by Zeina’s past life, Ghalia travels to Damascus to study acting. There she meets an aspiring filmmaker, fascinated by her duality, who finds her a place to live with other students. Soon the tumultuous events taking place in the streets begin to encroach on their own budding love affair.